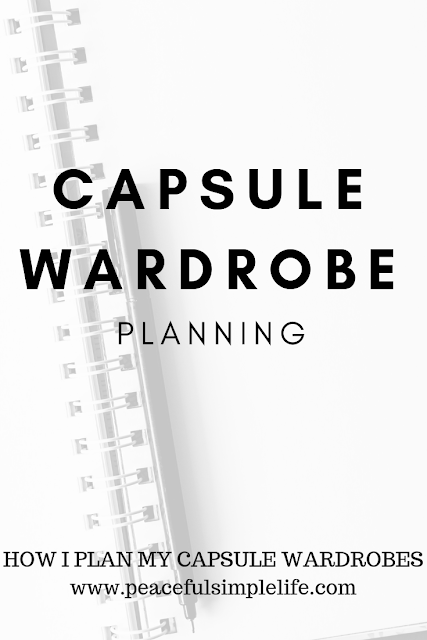 I have received a couple questions about how I set up my capsule wardrobe and how I actually use it. This week I plan to take you behind the scenes of my wardrobe planning on my Instagram account stories. In this blog post I will break down the 'steps' that I take to create my capsule. I often start with looking at my calendar. It isn't easy to plan a wardrobe if you don't know what your plans are going to be. My next wardrobe is going to start this weekend and go into the beginning of January. It will cover the whole holiday season. I will need to make sure that I have my Christmas outfit figured out and any outfits that I may need for Christmas parties or events. This year we really don't have a lot planned so I can stick to a much more casual wardrobe. I have had plans on other years and it pays to be prepared. After looking at my calendar and knowing what my schedule looks like, I try to plan outfits that suit what I am going to be doing. It is easy to plan a capsule wardrobe based on what you would like your life to look like, but it is much more important to be realistic about how you are going to spend your time. I spend much of my time chasing my two young children. I would love to have a fancy wardrobe, but it would not suit how I spend my time. Another important factor in a capsule wardrobe is weather. I know that the next few months are likely to be cold. I live on the prairies in Canada. I need to dress accordingly. I like to plan warm layers for my outfits so that I can brave the elements. The next step is optional, but I think it is a lot of fun. I will create a Pinterest board to help me figure out what styles I am into and what I want my wardrobe to look like. I find that the Pinterest board helps me narrow down what I want and makes it easier for me to pull out similar clothes from what I already own. At this point, I tackle my closet. I consider the pieces that are weather appropriate, fit well and are in good repair. I then narrow down my choices in my notebook. I try to stick to a number between 30-40 pieces. This time around I think I will try to stick to less pieces (20-30) because I plan to do another capsule in January. After I have chosen my pieces, I remove the other clothes from my closet and store them away. I like to have only my capsule pieces available to me. This removes any visual clutter and helps me to see what I really have to work with. I hope you will join me on Instagram and Pinterest this weekend as I build my next capsule wardrobe. Happy Wednesday, friends! Frugal Friday- The Holiday Season is Coming!